With this in mind and Oscar night upon us, we did a little number crunching and analysis to look at how people on Disqus are talking about this year’s nominees. Working with Temnos, a company that specializes in analyzing big piles of words and numbers, we analyzed over 200,000 comments and 850,000 votes across 3,000 articles and blog posts from January 1 to February 6. Here’s what we found. When examining what movies generated the most attention across Disqus, American Sniper and Selma dominated all coverage of the films nominated for best picture. Those two films alone accounted for 82% of page views. They had held a stronghold on comment volume as well. 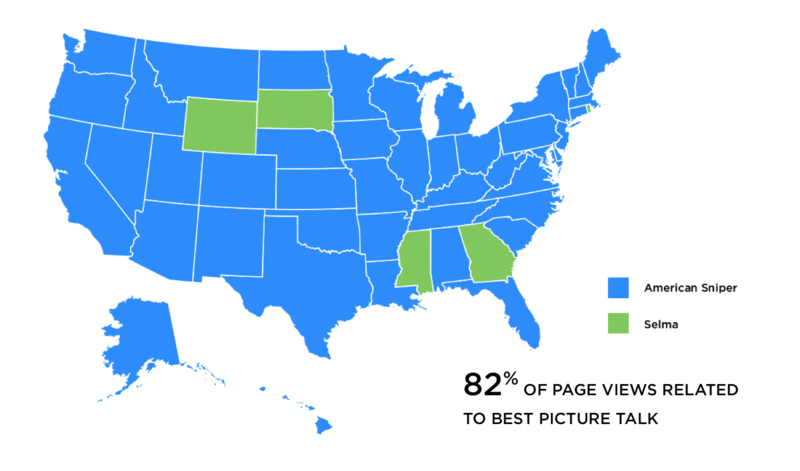 Across the US, American Sniper was the most talked about film. In only five states: Georgia, Mississippi, Rhode Island (the small but strong state you can barely see in green below), South Dakota, and Wyoming was it surpassed by Selma. Optimism Score: So Who’s Going to Win? To see if movie discussions on Disqus could actually predict which film would win, we went crazy and created something called an “Optimism Score.” For each film, we measured the percentage of comments where someone said they think that film will or should win best picture vs. comments that said that film should not or would not win. (Got it? It took me a while.) Overall, 3,300 comments were examined here as part of this particular analysis. 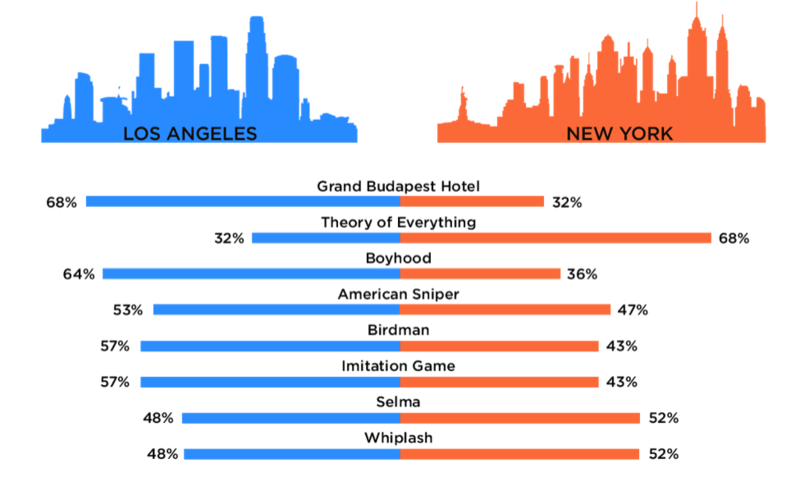 Grand Budapest Hotel, Theory of Everything and Boyhood had the biggest differences between commenters in LA and NYC. And I have my own theory as to why. Grand Budapest is directed by Wes Anderson. All of his movies have a signature, visual style of storytelling. 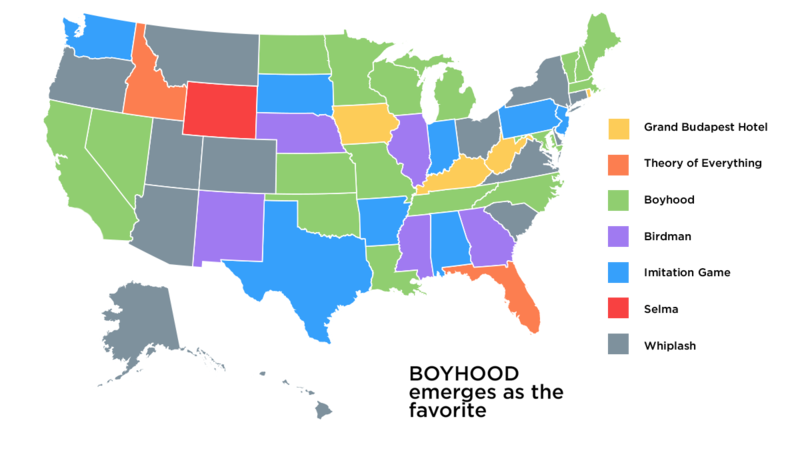 Boyhood is a coming of age story, most recognized for the fact that it was filmed over a 12 year period. Both of these films are marked by their production approaches. LA is home to movie making. On the other hand, Theory of Everything is a classic biopic about Stephen Hawking. NYC is the media capital of the world. A movie is much more likely to be reviewed there than made. New Yorkers just love a good story, well told. Overall, 54% of comments were from likely males, 46% from likely females. For most movies, the gender balance followed this overall split. However, as can be seen below, females commented far more on both of the "tortured genius" movies (Theory of Everything, The Imitation Game), while males commented more on Grand Budapest Hotel. Putting together the geographical and gender differentiation, the only other conclusion I can draw is that "likely men in LA" and "likely women in NY" would have a great debate about Grand Budapest Hotel and Theory of Everything. If anyone wants to moderate that discussion, let me know! PPS - Here’s an infographic summarizing much of this. Read the follow up post for more behind our findings. If you're interested in Disqus data, head over to our Data Solutions page to learn more.